Showing you this will be a little tricky. If it starts to seem a little geeky for you, come on back tomorrow. But one of the things that drew me to this house was the attic. It was a mess but the beams were gorgeous. I am used to living in places where you would never, ever waste even a broom closet, so the idea of leaving an entire beautiful, habitable floor of a house just sitting empty was a nonstarter. The attic was neglected, no surprise, and was blocked off, probably to help insulate the habitable floors. That was sad because this house design is all about axial symmetry. One axis runs front to back, with rooms opening to either side. The other runs top to bottom, with the rooms opening from the staircase. To let light and air flow through the house and to restore the axis, I had to open the stairwell from ground floor to roof. To stay warm, I insulated and put in somewhat-geothermal central heating. I have shown you much of the attic, so I’ll focus on the stairs. Tomorrow I’ll do a few attic shots for you guys who have not been with me since I moved from California. Above is the attic landing. Stuart wanted to note the poor condition of the handrail, thus the odd angle. You can see that a door opens directly to the left. There was also a door to the right. The wallboard was in terrible condition and the linoleum covered a multitude of sins. It all went. This is how that area looks now. We kept the handrail but reinforced it and shortened the landing, so we could tuck a shower into the bathroom. The bedroom door is straight ahead, with the door to the main room to the right. The flooring is sea grass; I just noticed how it resembles the old linoleum. The whole thing is lit by a skylight and a Le Klint light fixture. The staircase now. Jacques likes his toys. Here we kept the rails and that graceful curve. 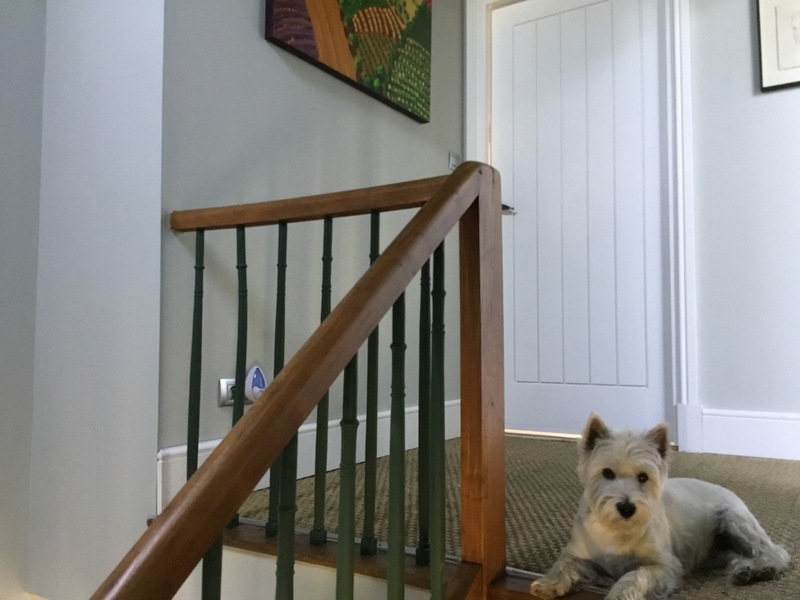 We refinished the stairs and replaced the drywall. The floor tile, which was peachier and cheesier than you can imagine from this photo, was replaced by pierre de Bourgogne. Yikes. Photos do show you all the flaws. Ignore that little piece of wadded up packing material, okay? And finally, here is a detail of the bannisters. I remember looking at those and thinking really, I can just buy them? 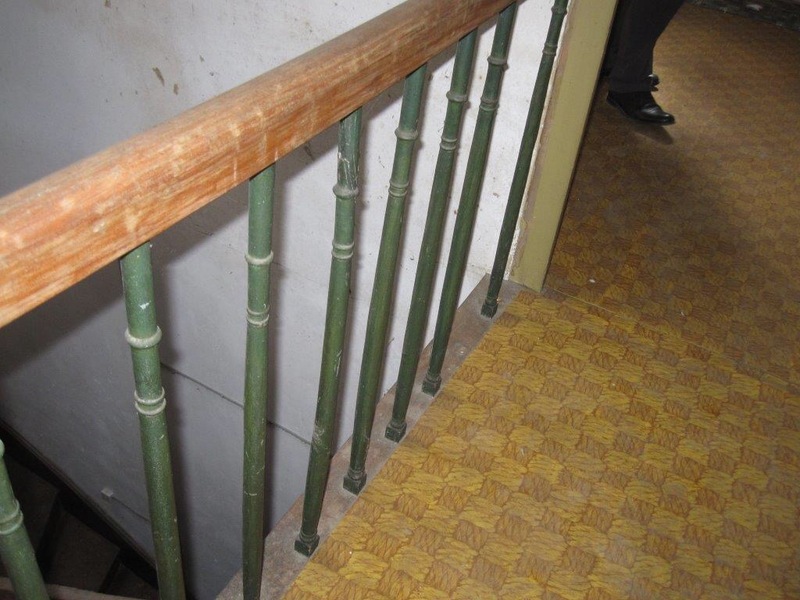 Look closely (or feel with your fingers): the rods of the bannisters probably are numbered from first to last. They are at a friend’s house of the same epoque. Seriously? I have to look for that. Okay, just did. No numbers. They are not entirely smooth but they are not all bumpy in the same place, either. Where on the rod does your friend find the numbers? Nope. Not there. 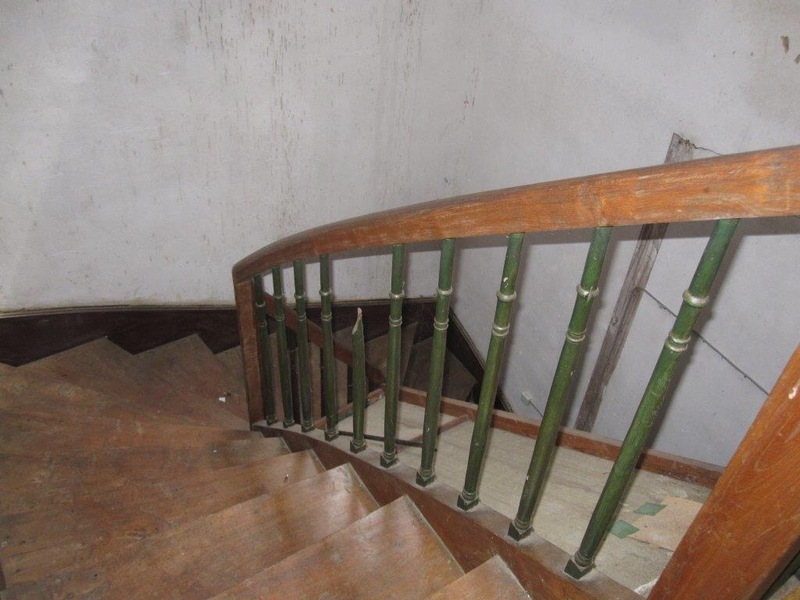 I wonder sometimes whether they cut the bannisters on site. Nothing moves but on some bannisters it looks like that might be what happened. Thank you. As I go through this exercise, all I can think of is how much of the work is hidden. I had forgotten, for example, that we replaced all the drywall. All most people see is the paint. That’s good but it is so far from the whole story. I’m sure you experience much the same thing. Yes, the structural stuff and the underpinnings are critically important . Unfortunately you don’t see all that in the finished project and it’s easy to forget what a chunk of the budget it took up. No they won’t. Only the cognoscenti will be amazed that they have a bathroom they don’t share, that it’s cool in summer and warm in winter, etc. Ah, life in the developed world. I used to take those things for granted, too. 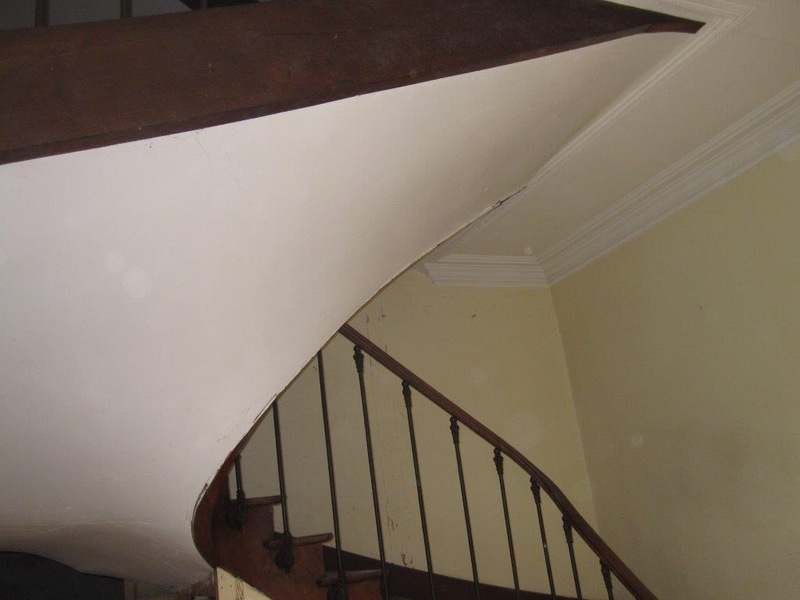 We had that staircase in the last house in France…down to the metalwork. 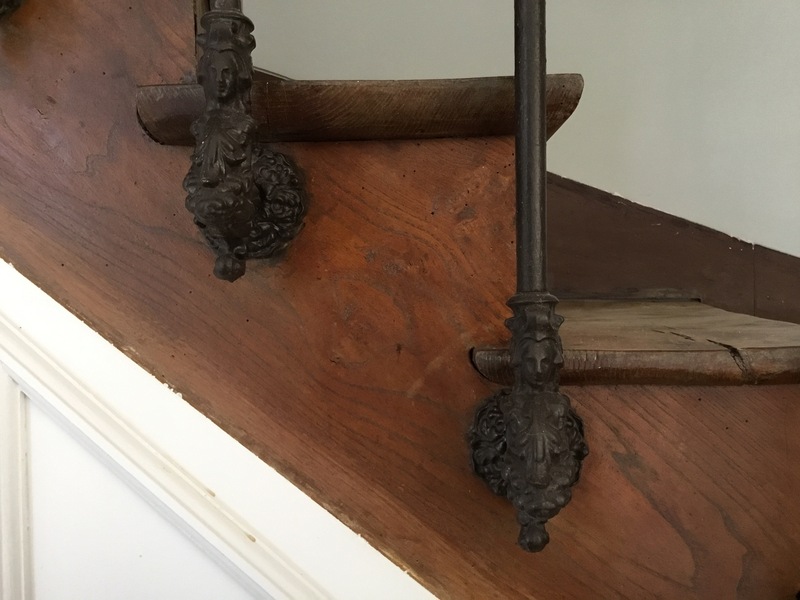 I can’t see from the photograph…did yours originally have a bronze cup on the newel post which would have held a cut glass globe? Interesting comment. One of the things I have been learning is how many of the things in this house that amazed my coastal California eye are, if you can afford them, bog standard in French country houses. You are the second person to say oh yeah, those stairs. Originally the finial was molded glass, I think, though it could be cut glass, well sanded. 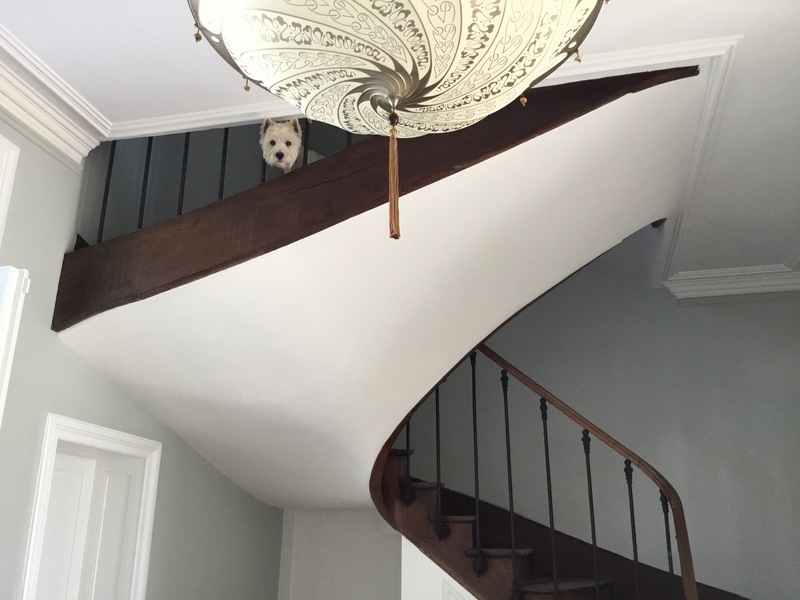 The other end of these stairs has one of the original glass finials. By the time I arrived there remained only one of the two, so I replaced the missing one with the one you see, which came from a glass factory in Brittany. I’m impressed that you did the work yourself. I have a very talented woodworker, Xavier, who sanded these stairs for me. He waited for me to leave because he would be making such a mess for such a long period of time. There was so much built-up wax and gunk that he used two or three sanding pads per step and blew out his sander. Xavier and Kieron also reinforced the wobbly parts of the stairs and replaced a couple of broken bannisters. There were cracks in the underside plaster, so Kieron and Mike ripped it all out — there’s another dirty job — then roughed in new, which Emma replastered. That’s four skilled workers who, overall, needed about a month to get these stairs back in shape. You did it yourself? Bravo! 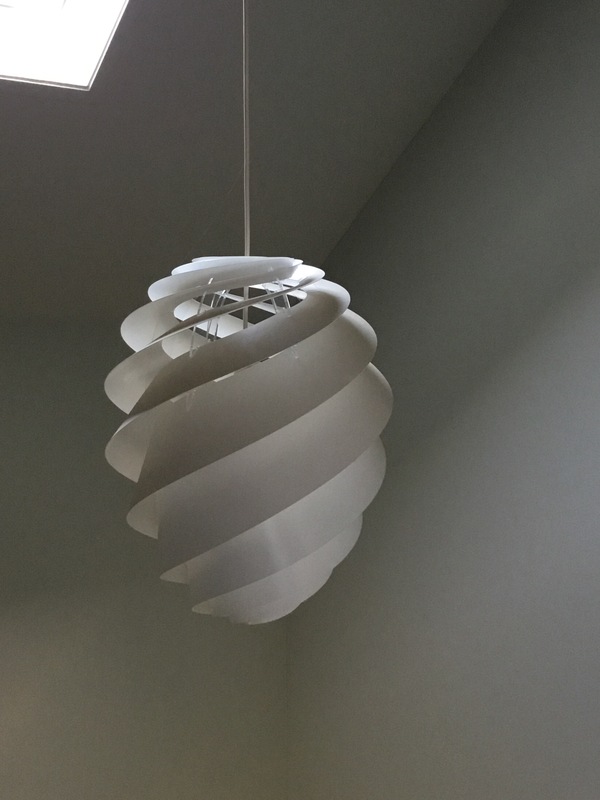 A question of having to…my builders were fully occupied with stripping the rendering from the exterior walls which had trapped damp, knocking out low ceilings which obscured the beams and all the other heavy work. 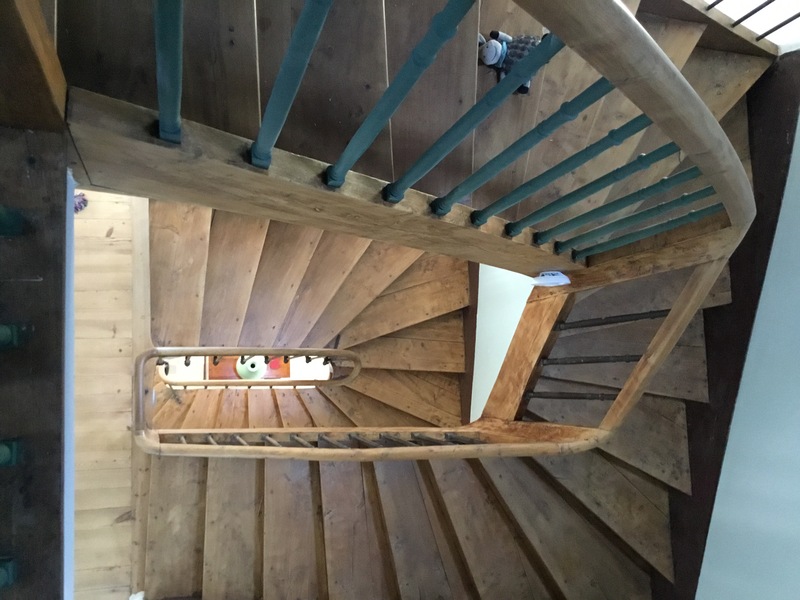 The underside plaster was not too bad…but needed skimming, I had to make good where inappropriate plumbing had had to be removed from the stairwell…and my knees will never be the same after the staircase and four floors of floorboards to sand and wax. Not to speak of the earlier job mounting what felt like the scaffold rather than scaffolding every day to treat the beams for death watch beetle and the like followed by staining and varnishing. 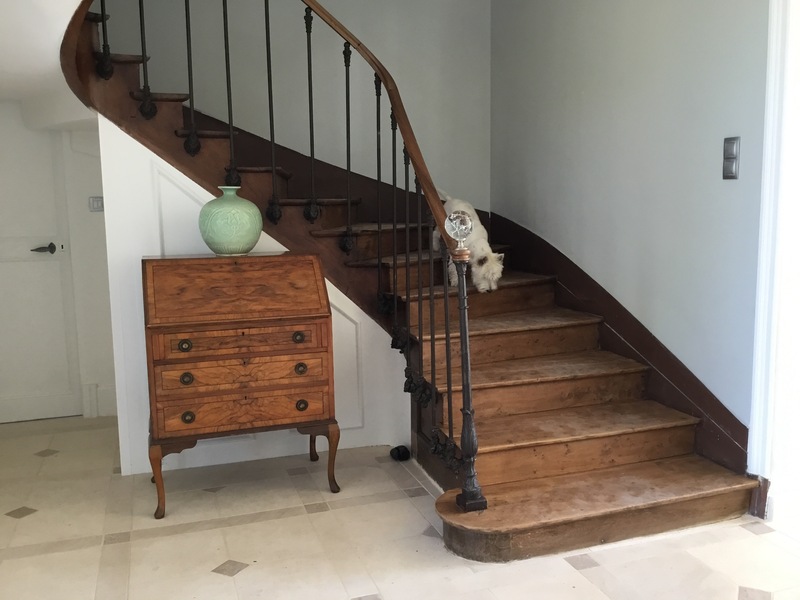 I gave up on the artisan francais very early in the time when I renovated houses…a friend put me on to a firm of Turks whose boss had a really good eye for buildings – they were honest, worked like Trojans and worked to a high standard. They would have done a good job on the wood…but there was too much else needing attention if this particular house was ever to be habitable again. My guys are mostly English and Albanian. I find myself juggling Christian and Muslim holidays but the rest of the time they work their butts off. The French crew are great fun but with what they drink, I’m amazed they stay upright. Now that I am in the house it all seems like a great adventure but while I was camping, none of this was amusing. Honestly, I am impressed that you did so much. My idea of pitching in is screwing in cabinet pulls. 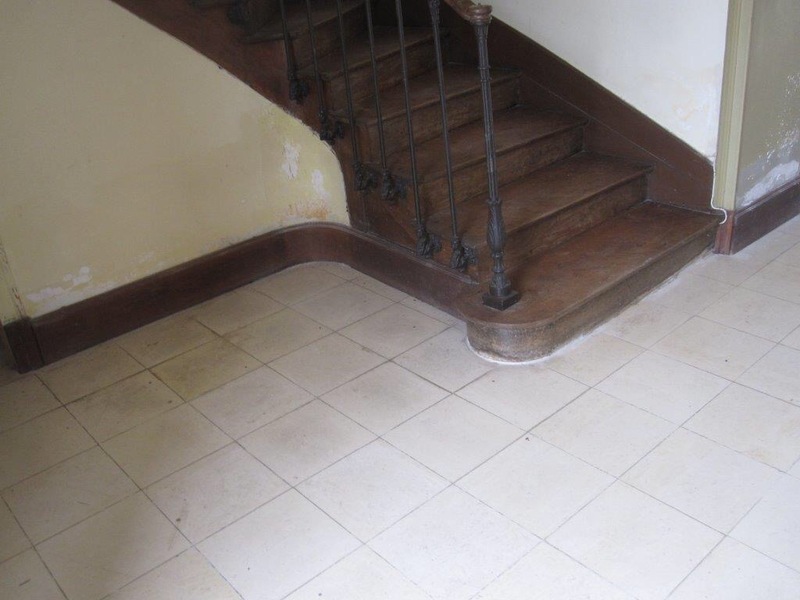 My last straw with the artisan francais came quite early on when I instructed the firm to install a damp course and then as they had – as usual – disappeared, rashly went off for a week myself. They must have been watching the house as in that time the so and sos dry lined the area in question, thus completely throwing out my measurements for the kitchen. Not to speak of the cadeaux empoisonnes – the concrete mixed but not used before lunch and tipped under shrubs – and the price fixing for foreigners…. Still, by getting rid of them I learned a great deal by way of practical skills. Yes, I have some interesting cleanup challenges out in the garden too, now that you mention it. I think when they come back from vacation I’ll pretend I just noticed. I’ll point it out in my best “oh, you missed a spot” style. If that doesn’t work I’ll tell them rough concrete is hard on Jacques’ feet. They are crazy about Jacques. And Jacques looks so regal there!